Every so often you will hear about a casual punter who wins £100,000 from a £2 punt on a six or seven horse accumulator. There is also the odd long-priced winner at a big festival, but in general, bookies do exceedingly well because of the average person’s propensity to bet on a longshot rather than a favourite. The “favourite-longshot bias” is a phenomenon where punters prefer to risk money on a longshot rather than playing it safe and backing a short-priced favourite. Such individuals mistakenly believe they are getting value from their punt, but in reality, the bookmakers long ago realised the potential for profiting from this bias and have adjusted their odds accordingly. As you already know, bookmakers create an overround to ensure their book is profitable. You can expect a 3% overround on the win/draw/lose market of a major football match for example. In horse racing, especially in major races, it becomes all too easy to bump the overround to ludicrous levels. This year’s Gold Cup, for example, carries an overround in excess of 10%. Uninformed punters may think no-hopers such as Double Shuffle or Yala Enki have a chance and waste their money, solely because of the huge odds on offer. Aside from Norton’s Coin, who shocked the world in 1990 by winning at odds of 100/1, no horse has won the Cheltenham Gold Cup at SP odds of more than 33/1. Note the race was inaugurated in 1924. In contrast, horses near the top end of the market are often successful which makes the tendency to back longshots in this particular race especially ruinous. In races with several no-hopers, bookmakers can increase the odds of the longshot while simultaneously cutting the odds of horses with a real chance of winning. It is easy for them to cut Clan De Obeaux’s odds from 6.00 to 5.50 and increase the odds of Yala Enki from 101.00 to 201.00 for example. They know it would take a miracle for Yala Enki to win, while Clan des Obeaux has an excellent chance. Moreover, bets on the former will be relatively small, while the big hitters are likely to pile into the latter. Overall, bookies can keep their overround nice and high while also reducing their potential liability. In simple terms, the goal is always to search for value bets. Don’t assume you are getting value from a longshot. In reality, the opposite is usually the case. Imagine backing a horse at odds of 50/1. If its real chances of winning are less than 1%, you are NOT getting value. In contrast, if a horse has a 75% chance of winning and its odds are 1.50, you ARE getting value because the bookies believe the horse only has a 66.66% chance of victory. How Often Do Favourites & Longshots Win in UK Racing? Now we get to the crux of the matter and show you why betting on longshots is an unprofitable strategy in the long-term. I have looked at data in UK racing since the beginning of 2010. First of all, odds-on favourites at SP (between 1.02 and 1.91) have won 59.81% of all races in the UK. Blind backing of all 13,666 clear favourites would have resulted in a loss of 4.56%. Odds-on favourites at Betfair odds of between 1.01 and 1.99 have won 61.28% of races and backing all 12,233 horses would have resulted in a loss of 2.24%. Next, I looked at the performance of all clear favourites in UK races, regardless of the odds. They have won 34.94% of all races at SP prices, and backing all 84,317 of them would have resulted in a heavy loss of 6.47%. The first step is to look at horses at SP odds of 25/1 or greater. There are so many of them since 2010 that I chose to focus on results since the beginning of 2014 instead. 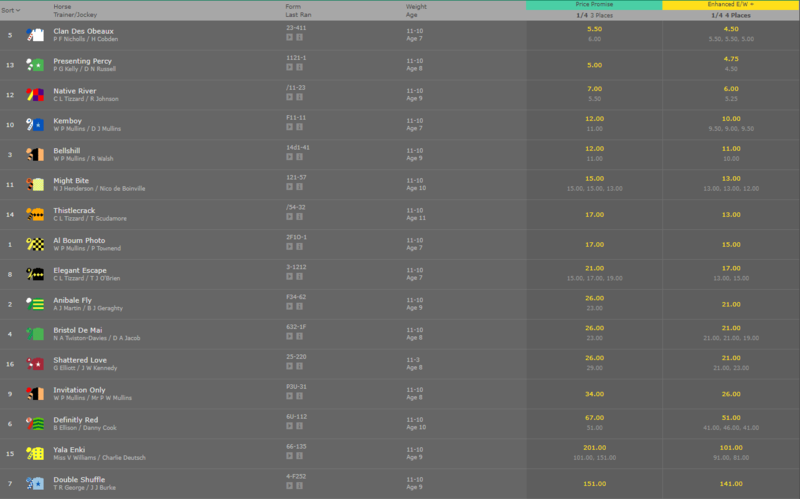 Overall, just 1.31% of these horses won; backing them all would have resulted in an enormous loss of 53.34%! Next, I looked at horses at odds of 50/1 or greater; again since 2014. Just 0.5% of these horses win and backing all of them would have resulted in a loss of 68.42%! If any event carries odds of 50/1, you need it to win 1.96% of the time to break even. However, only 0.84% of horses at SP odds of exactly 50/1 win a race in the UK. Backing them all would result in a loss of 57%. If you back any event at odds of 100/1, you need it to win 0.99% of the time to break even. However, only 0.19% of all 100/1 shots win races in the UK. Backing them all would lead to an incredibly high loss of 80.78%. On the Betfair exchange, 0.43% of horses at odds of 100/1 or greater win a race; a far better return. Even so, backing them all would result in a loss of 20.78% on Betfair. Far too many punters make the mistake of ruling out odds-on horses without bothering to check if it is a value bet. Most people figured Altior was “too short” at 1.36 (you could have got around 1.50 on the Exchanges earlier in the day) to win at Cheltenham in 2018. While he admittedly had to work harder than expected, he still won. When you consider that Altior had won 17 consecutive races going into the event and it was a non-handicap race, it was legitimately bizarre to walk away from a bet that had an enormous chance of being successful. Let’s say you got odds of 1.50 on the Exchange, do you really think Altior’s chances of winning the race were less than 66.66%? There were doubtless punters that backed Ordinary World and Saint Calvados in the same race as both were outsiders; neither finished within 24 lengths of the winner. In summation, if you continue to succumb to the favourite-longshot bias, you are feathering the nests of the bookmakers. They have long since grown wise to the fact that punters love a long-odds bet, and they have no problem giving you what you ask for. It makes no difference to them if a horse is 150/1 or 200/1, it almost certainly isn’t going to win anyway.